You’ve finished the daunting task of writing your cover letter, and you nailed it. You took our advice on how to start your cover letter and how long should your cover letter be to craft the perfect cover letter. You showcased your unique experience and even injected some of your personality. Now, it’s time to wrap up the letter and send it off to the hiring manager. Seems easy, right? Yet your hands lie idle on the keyboard, frozen in time. It’s not so easy after all. If you follow these tips and tricks for signing off your cover letter, you will soon be submitting your application, waiting for that call to schedule an interview. You may be tempted to rush through the ending of your cover letter. After all, you’ve already done the heavy lifting with the experience and honesty you included in the actual letter. The ending couldn’t possibly matter that much. But it does. If you come across desperate or needy, the hiring manager will immediately be turned off and you can kiss your chance of getting an interview goodbye. If you ask for too much, the hiring manager might think you feel entitled to the position, leaving a bad taste in their mouth. You want your cover letter to end with a feeling of gratitude and a clear understanding of who you are and why you deserve an interview. 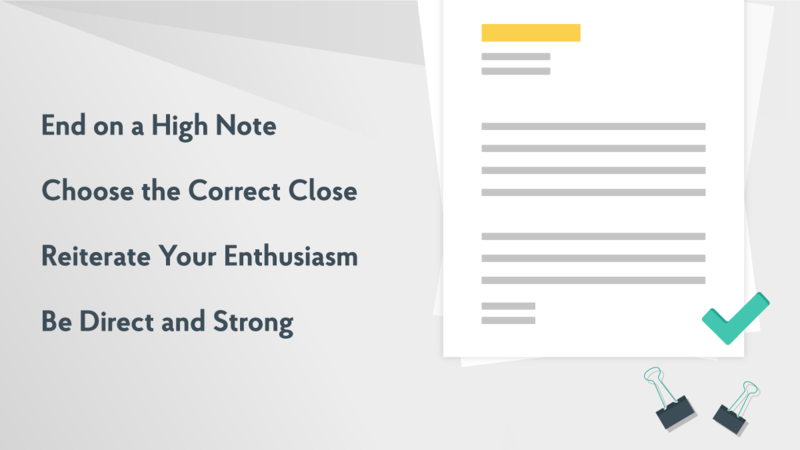 The last phrase of your cover letter should reiterate your enthusiasm and seal the deal with the hiring manager. Your ending is what will be remembered, and it should be direct and strong. If you use a passive voice (i.e. : “I look forward to hearing from you”), the reader will not feel compelled to call you in for an interview. Here are some great examples demonstrating how you can end your cover letter. This statement showcases your enthusiasm for the position and leaves the hiring manager wanting to learn more about you and why you believe you’re such an excellent fit for this position and organization. By showing your eagerness to jump in and begin performing the required duties of the position, the hiring manager will be enticed to bring you in and learn about what you plan to bring to the position. Hiring managers are always looking for what you, the applicant, can do for their company and not what they can do for you. Showing that you have qualities that will drive their business forward will please the hiring manager and they will want to bring you in to discuss further. This is a bold tactic that doesn’t always work. You can certainly use this statement but always proceed with caution. Your confident demeanor may turn some hiring managers off, while it may impress others. So always be aware of the organization and person you are sending this to ensure you won’t offend the hiring manager. End the cover letter with your name and add any relevant contact information below your name so the hiring manager can contact you immediately if they feel you are a fit. A phone number and email address below your name can make it that much easier for the hiring manager to get in touch with you. Follow these simple steps, and you will have your next interview scheduled in no time.